We’re specialists in UK rehab options and can advise you on alcohol rehab in the North West, drug rehab in the North West and other addiction support services in the area. At Port of Call, we understand the complexities and complications caused by addiction and the confusion and concerns around finding rehab. We’re here to answer your questions, offer advice on the options and book you in should rehab be the right route for you or a loved one. Finding help with an addiction in the North West is rarely as straightforward as it, perhaps, ought to be. There is a myriad of options for community support both through statutory organisations and charities, the NHS and privately. The difference between publicly funded options and private ones is often around the level of flexibility. Privately funded options will usually allow you to find what you specifically need, when you need it – but may represent a significant investment. Often the decision rests on how urgent the need is – if you’ve reached crisis point and are ready to seize the day to begin recovery you may feel finding the necessary funds is, literally, a price worth paying. Accepting you have an addiction and can’t dig your way out of it without intervention is a very difficult place to reach. We understand that at Port of Call and have dealt with hundreds of individuals who are struggling to come to terms with their situation. We can talk you through the process of a managed intervention – where you’ll present the person in need of help with the facts and potential solutions in a way most likely to reach them. What happens in rehab in the North West? Rehab in the North West will likely involve some form of talking therapies or counselling either in group sessions or on a one-to-one basis. These help people to find the root cause of their addiction and begin the process of finding ways to live without drugs or alcohol. 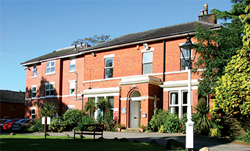 The environments where rehab can take place vary hugely from hotel-like, high-quality facilities, with gyms and dining areas through to more homely settings or even clinical locations. Rehab often doesn’t cost as much as people fear especially when, for many, it is the key to getting their life back. Costs may begin at around £1,500 per week. Stays of around four weeks may be optimal but successful routes to treatment can be found where budgets do not stretch to that. Please do get in touch to talk through your particular situation.